Today, the Indian Princess Head Gold One-Dollar Coin remembers when the first overland mail arrived in St. Louis on October 9, 1858. The rush to the new gold-mines in California went steadily forward by steamer, while more than 100,000 men, since the discoveries, had made the trip across the plains by the end of 1852. With the rapid strides the new El Dorado was then making — a progress unprecedented in the annals of civilization — and with only two mails a month from New York and the outside world, it was not to be wondered at that there should have been a persistent clamor for a direct overland mail. The idea was talked of by prominent officials all over the country; every Californian urged it; the subject was agitated by most of the leading newspapers at the time, as it had been for several years before. Finally, the subject was pressed so vigorously that an act relative to the “Overland California Mail,” passed Congress in the closing hours of the session which terminated the administration of Franklin Pierce, March 3, 1857. The bids were opened on the 1st of July, 1857. In all, there were nine bids received from various parties, each naming the routes over which they proposed carrying the mail. After carefully examining the bids, a few “observations” were submitted by the department officials in relation to the reasons which induced a preference for a southern route, which was selected. The trip was to be made within twenty-five days, in four-horse coaches, suitable for the conveyance of passengers as well as the safety and security of the mails. The “northern route” proposed in one of the bids was for carrying the mail from St. Louis, by Independence, Fort Laramie, Salt Lake, etc. This route was not favorably considered by the post-office officials at Washington. The department had the recorded experience of many years against the practicability of procuring anything like a regular and certain service on this route. The Government had had a mail carried for years over it, and the result on file at the department then showed the most conclusive facts against its selection. As an example, it was shown that the mails for November, 1850, did not arrive until March, 1851. It was noticeable that the winter months of 1851-52 were also very severe. The service was also interfered with by “deep snow” during January and February, 1854, the unusual depth of snow keeping the mails back until the following April. From the various reports submitted by the department it was shown that there had been no improvement in the service even down to the November mail of 1856, which left Independence November 1, and, on account of the “deep snow,” was obliged to winter in the mountains. For four months of the year, it appears from the reports, snow caused almost an entire failure in the transportation of the mails across the plains and mountains. These actual experiments, made for six successive years since 1850, without referring to the concurring testimony of explorers and travelers, naturally put this route entirely out of the question for the transportation of the mail overland. From the best and most reliable information obtained at that time, it was the belief of the Postmaster-general that there was no other all-the-year route between the Mississippi and the Pacific than the one chosen by the department. The Albuquerque route, like the one still further north via Independence, it appeared to the postal department, at that early day, was impracticable. In the judgment of the Postmaster-general, the foregoing route was selected as combining more advantages and fewer disadvantages than any other. Among the various bids presented, it appears there was none that referred to this particular route. However, all the bidders had consented that their bids might be held and considered as extending and applying to said route. The contract was accordingly let, on July 2, and signed September 15, 1857. It was not until a year after the contract was signed, however, that everything was in readiness — the line equipped, stations built, and all things arranged for beginning operations. The act, as passed by Congress, provided for a compensation not exceeding $600,000 per annum for semiweekly service for a term of six years. The successful bidders were John Butterfield, Wm, B. Dinsmore, Wm. G. Fargo, D. N. Barney, Hamilton Spencer and some half a dozen other prominent citizens of the State of New York. The length of the through overland stage route — the one the company was finally obliged to accept and travel, in the form of a semicircle from St. Louis and San Francisco— was 2729 miles. The most southerly point touched on the route was 600 miles below South Pass, or nearly four degrees farther south than there was really any need of going, thereby making at least two and one-half days of extra travel. The schedule time was twenty-five days, or about three days ahead of the ocean steamer. The mail matter transported overland was composed almost exclusively of letters — postage ten cents on each half-ounce — but, through the courtesy of the mail company, a limited number of St. Louis, San Francisco and other leading dailies of the country were carried, and furnished the press as well as a few prominent officials at the eastern and western termini. The line during those early days was splendidly equipped, having over 100 of the very best Concord stage-coaches, 1000 horses, 500 mules, and 750 men, of whom about 150 were employed as drivers. The fare across the continent by stage was $100 in gold. On each of the first coaches that departed from either end of the line was a correspondent of one of the great New York dailies of that time. The coach going east from San Francisco made the trip through to St. Louis in a half-hour less than twenty-four days. The first stage west made the distance in an hour or two less time. Both coaches, however, were a day ahead of the schedule. The arrival of the initial stage at either end of the route, on October 9, 1858, was hailed with delight. It was proof that the long-talked-of “overland mail” was no longer a myth, but a genuine reality — in every respect a fixed fact — and the event was celebrated in a fitting manner. Six passengers came through to St. Louis on the first “over-land mail” coach from San Francisco. The occasion of the arrival was considered an event so important that a number of speeches were made, and the first mails over the new line were escorted from the Missouri Pacific railroad depot on Seventh street to the post-office by a long procession, led by brass bands discoursing stirring music. “Jefferson City, October 9, 1858. 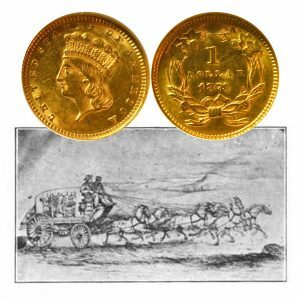 The Indian Princess Head Gold One-Dollar Coin shows with an artist’s image of an early overland stage coach carrying the mail.